We are willing to take dogs from people who can no longer keep their dogs for whatever reason. There is NO fee for us to take your dog. There will no shaming you or trying to make you feel worse. If you can no longer keep your dog, please call us. 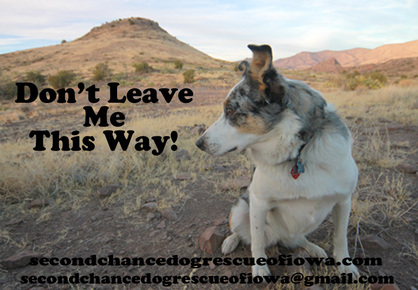 If we have room and believe we can find your dog a new home, we will help you. Please do not dump your dog. It is not safe and it is very likely your dog will die. Please call or test us at 641-297-2137.